eVe (eVision Visual engine) is an advanced Visual Search engine that includes analysis, storage, indexing, and search/retrieval of images and video. Unlike a classical keyword-based search, eVision software retrieves images by analyzing their perceptual content. Images do not need to be viewed, interpreted, or keyworded by humans. eVe breaks new ground in Visual Search by bringing automatic segmentation to the commercial world. 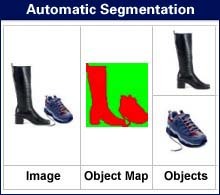 Segmentation is the process by which an image is divided into regions, which correspond approximately to objects or parts of objects in an image. Once these object regions are identified, features such as color, texture and shape are extracted. Similarity comparisons are then made to other objects in other images. To use an implementation of eVe, you can either give eVe a sample query image, select an image from the Visual Vocabulary selection, or enter a keyword and then "Zero In" your search to find additional pictures based on visual similarity. These results are ranked according to relevance, and can be further refined. APIs, plug-ins, and applications that take advantage of the eVision Visual Search Technology. These 3 working demos of eVe will give you the opportunity to try out eVision's Visual Search technology on real data. The demos each address a different level of sophistication and features that a developer can add to a visual search application. How eVe is functionally and technically unique from other visual search solutions. A technical overview of content-based image search technology, the market size & need, and the unique solution offered by eVision. From "What is Visual Search?" to "What is Visual Vocabulary?" Obtaining good visual search results is a combination of a clean database and some simple search heuristics. The possibilities for software developers to customize eVe are virtually unlimited.